..on the world wide web, to find a great place to get good, quality, humor. 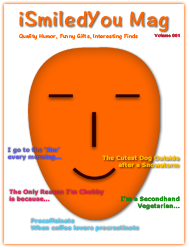 There are hundreds of sites, pages, profiles, groups, and forums devoted to humor. And to sift through their content, to get your daily dose (of good, quality humor), requires an amount of browsing that'll leave you numb and exhausted, than entertained. Also when it comes to great humor, I want it all - hilarious stand up routines, crazy YouTube videos, funny ads, jokes, short films, anecdotes, animations, funny pics, cartoons, memes, status updates, caricatures, funny emails, tweets... the whole nine yards. And I want all of it to be curated content, so I dont need to sift through thousands to occasionally come by the absolute gems. ..to come across genuinely funny gifts, whenever I have wanted to gift one. Funny gifts for different occasions, funny gifts for my friends, for different people, for different relations. These experiences, have led me to set up iSmiledYou. Everything on iSmiledYou is handpicked. Hi I'm Vipul, the curator, at iSmiledYou. I hope you enjoy the time spent here, the humor, the blog posts, the finds. iSmiledYou has been created to entertain you, to leave you smiling. Get the latest iSmiledYou blog post in your email.